EMI announcse the release of the fully-restored 1967 Beatles classic feature film Magical Mystery Tour to DVD and Blu-Ray! The release features a host of special features, packed with unseen footage. There are newly-filmed interviews with Paul McCartney, Ringo Starr, and other members of the film's cast and crew, as well as a director's audio commentary recorded by Paul! Magical Mystery Tour will be released October 9th! Magical Mystery Tour - on DVD and Blu-ray 10/9! 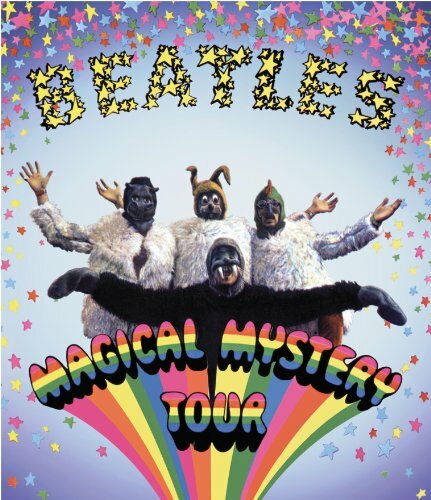 Based on a loose unscripted narrative, in the spirit of the experimental mood of the time, and directed by The Beatles themselves, the film became the vehicle to present 6 new songs - Magical Mystery Tour, The Fool On The Hill, Flying, I Am The Walrus, Blue Jay Way and Your Mother Should Know. "The Making of Magical Mystery Tour" [19:05] - Features interviews with Paul and Ringo, along with other cast members and crew. Includes unseen footage. "Ringo the Actor" [2:30] - Ringo Starr reflecting on his role in the film. "Meet the Supporting Cast" [11:27] - A feature on the background and careers of Nat Jackley, Jessie Robins, Ivor Cutler, The Bonzo Dog Doo-Dah Band, Victor Spinetti, George Claydon, and Derek Royle. "Your Mother Should Know" [2:35] "Blue Jay Way" [3:53] "The Fool On The Hill" [3:05] - Three new edits of these performances, all featuring footage not seen in the original film. "Hello Goodbye," as featured on "Top of the Pops" - 1967 [3:24] - The Beatles allowed the BBC to film them in the edit suite where they were working on Magical Mystery Tour. This was then turned into a promo by the BBC, who shot their own additional footage. It was then broadcast on "Top of the Pops" to mark the "Hello Goodbye" single going to No. 1 in December 1967. "Nat's Dream" [2:50] - A scene directed by John featuring Nat Jackley and not included in the original film. Ivor Cutler - "I'm Going In A Field" [2:35] - Ivor performs "I'm Going In A Field," in a field. This scene was not included in the original film. Traffic - "Here We Go Round The Mulberry Bush" [1:53] - The filming of Traffic acting out their 1967 hit single "Here We Go Round The Mulberry Bush" was commissioned by The Beatles for possible inclusion in Magical Mystery Tour, but was not included in the final edit.